Blog: Microsoft | Avcomm Solutions, Inc.
Plenom, the manufacturer of Kuando Busylights, has revolutionized presence notification with its easy-to-deploy, easy-to-use Busylights (compatible with Microsoft Lync/Skype for Business and Cisco Jabber). Communication is essential with both colleagues and customers – Busylight is designed to help reduce interruptions so you have a better work environment. By deploying Busylights in the office, the goal is to improve your work environment by reducing distractions and creating a less stressful workplace. The tall, skinny Alpha Busylight is perfect for mounting to the top of PC monitors or laptops, while the Omega Busylight is a larger light best for mounting on cubicle walls. In addition to being a visual presence reminder, the Kuando Busylight is also a reliable ringer for softphones, making it easy to hear and see incoming calls. • Everyone should not be in a "busy" or "do-not-disturb" state at the same time. (red/purple). • Keep your presence set correctly – if back from meetings early change your status to green. Plenom has created handy guides with status notifications, so that everyone using the lights is aware of their meaning. Email us if you would like to have these 8 1/2 x 11" guides sent to you. Go to the Software Download page on the Plenom web site, here: Software Download and select the correct software. Will you be using the Busylight with Microsoft Skype for Business or Cisco Jabber? Or, will you manually change the color of the light? Download the software. Attach the adhesive magnet or adhesive tape mount to the bottom of the Busylight, and attach the light to a cubicle wall, PC monitor, or laptop. 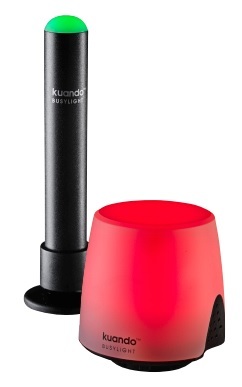 Kuando Busylights are one of the best new tools for open offices, UC software platforms, and busy professionals. If you would like to learn more about them, or to qualify for a free trial unit, contact us today! A steady uptick in headset use, and the rise of unified communications platforms such as Skype for Business, Lync, Cisco Jabber, (and many more), have contributed to the need for Busylights in office environments around the world, especially in the prevalent open office design. It rings and flashes on incoming calls preventing missed calls. It provides visual presence to the open office, stopping interruptions. The Busylight software (Skype for Business only) provides valuable hot key functions for easy call handling. Mute on Away – When in the ‘Away’ state, Busylight will not ring – nice for your neighbor! Default brightness for Alpha is lowered from high to normal. What's the difference between the Alpha and the Omega? The Alpha Busylight has a smaller profile and features a smart click On/Off system for monitors/ laptops. The Omega Busylight has a larger light and is ideally suited for cubicles. KuandoBOX unifies your presence by connecting to both desk phone and computer, to update user’s status to "Busy" in Skype for Business / Lync when talking on the desk phone. Download the FREE software on the Plenom website: Software Download. Plenom is currently at work on a NEW Busylight for Apple Mac computers. We will let you know when these are available! The Jabra Stealth UC headset weighs no more than a quarter, is shorter than a standard toothpick, yet delivers powerful technology. If you’re looking for a small, lightweight and discreet Bluetooth headset that fits directly into your ear, the Jabra Stealth UC fits the bill. As a Red Dot Design Award 2015 winner, the product’s design has been given the “cool” stamp of approval. The Stealth headset has been available for about a year; the addition of the USB dongle has made the headset feasible for the UC market. 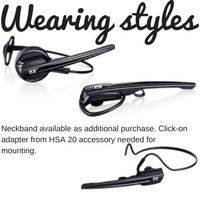 Those who work with their PC and smartphone will enjoy the ability to use either device with this headset. Available in both UC and Microsoft Lync-optimized versions, the Stealth UC is compatible with any major softphone on the market. A microPOWER battery (typically found in hearing aids) makes this the lightest-weight Bluetooth headset on the market – a mere 0.28 ounce! The small design provides a comfortable in-ear fit for wearing in either the left or right ear. To customize the fit, two sets (3 red and 3 black) of comfort ear gels of various sizes are included (see image). Users who prefer an ear hook wearing style have 2 different sizes of ear hook to choose from, which are also included in the box. The Stealth will stay in the ear, so an ear hook is not necessary. 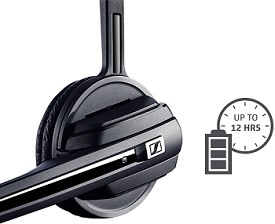 Wearers get talk time of up to 6 hours; to a fully charge the headset takes about two hours. 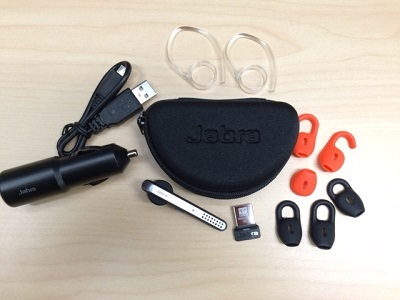 A micro USB to USB charge cord and car charger are included in the box. 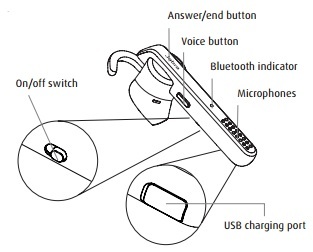 A wall charger is available as an accessory purchase; however, most standard mini USB to USB charge cords will charge the headset (the exception is the iPhone 5 and 6 power cords). Talk time is stated each time you turn the headset on, so there are no surprises when you’re in the middle of a call, the battery dies, and your calls gets dropped! Dedicated voice control button to communicate with Siri or Google Now (device dependent). Noise Blackout technology with dual mics for noise-cancelling. HD Voice enhances sound quality. Intelligent volume control automatically adjusts the volume you hear in your speaker. Dedicated Apple hardware built-in enables the “Made for Apple iOS” certificate. MSRP for the Jabra Stealth UC and Stealth MS is $150.00. To enhance the Stealth UC experience, download the free Jabra apps. More information about the apps can be found here: Jabra Apps. In addition to your headset’s features, you can control how much it needs to take care of sound disturbances around you. Choose between three fixed settings - office, outdoors or in the car. Other features include pairing wizard for easy pairing; see battery status and control volume during a call; a full user manual for Jabra Bluetooth devices; Audio Notes to record notes and send them via email; and Geo-tag for the headset, should you lose it. Geo-tag shows the last location the headset was turned on at. Jabra Assist helps you pair the headset with your device of choice without hassle, the battery meter warns you when you need to recharge your device, and when you need help using your headset and in-car speakerphone you can check the animated user guidelines in the app.